Peel: "I see a violent death...."
Steed: "It always starts that way." "WHOOPS—You really must talk to that cleaning lady of yours!" This episode is formulaic for the Avengers, not bad, but not one of the best. The opening is exciting, but the story derails a bit into some of their own branded clichés. An agent disappears on a train after being tricked into getting off at an abandoned station. Our heroes find his body and begin their inquiries, eventually leading them to a Navy Admiral—seems Emma had spotted his secretary on the train, as well as an obvious pair of newlyweds. When the secretary is double-crossed, Mrs. Peel discovers a stack of train tickets in his possession containing microdots. Meanwhile, Steed goes missing, and Emma enlists the aid of an old train buff and an agent friend of Steed's to find him, uncovering an assassination plot along the route. Rigg has a couple of great fight scenes, including a classic face-off with a fork-wielding blonde in the dining car. And John Laurie as Mr. Crewe, the rail enthusiast, is charmingly funny as her stand-in sidekick. Libations: Dry, dry, dry, although they do get a bit steamed in the end.Three cheers for keeping this train on track. "Come along then, there's a good boy. Show Nanny where you keep the pretty little missiles." Top secrets are leaking to the enemy, information imparted only to noblemen considered "British to the core," none of them possibly susceptible to treason. The episode starter has the now signature running man, an agent, chased by an unknown assailant. He arrives haggard and breathless at the home of an important General but finds no one at home. The agent manages to make a quick call to state his whereabouts before a spirally "baby bouncer" crashes through the window. As he examines it, he begins hallucinating back to his nursery days, until his nanny enters and shoots him. When several of the men recall "dreaming" of their nannies, John and Emma track down the exclusive bouncers to an equally exclusive school for nannies, run by everyone's favorite nursery guardian, Nanny Roberts. When the school's spies finally reach the General in charge of the secret project, the ball ends up in our heroes' court. Although a standard school-fronting-a-different-sort-of-school Avengers plot, it lacks some of the real fun usually well woven into these scripts. Note to the continuity editor: Steed is not wearing gloves in the beginning of his scene with the General, but conveniently has them on when the bad guys enter. And—what is the reason for that stop-frame as the nanny leaps into the back of the getaway car? Libations: Steed has a scotch; Emma is too busy for even a cuppa with Nanny. I rate this 2-1/2 drinkies of 5. Didn't you know our versatile Mrs. Peel was a Bridge Master? We begin with a tight shot of someone reading a magazine article she has penned on the subject, illustrated with a full-page photo of her. The reader slowly and methodically cuts this photo into pieces, but we see only the hands, adorned with a large ring shaped in a spade. Emma arrives at Steed's place and as he comes to answer the door, he has a clumsy fall on the stairs. Laid up on the couch for a while, Emma leaves him for a visit to a noted bridge player's estate. She arrives at her remote destination to find the owner out, having left his home and his guest to the care of a very strange young woman. A bizarre night unfolds for Mrs. Peel (doesn't it always when she's invited to odd country estates? ), who seems targeted for love and death. This is a fabulous episode populated with strange and lively characters, a huge and colorful set, genuinely scary moments and brilliant editing (especially in the dining room scene as the villain is revealed, piece by piece, interspersed with the pieces cut from Emma's photo). Although we have seen similar storylines before, this is by far the best of them. Note to continuity editor: How ever did Steed cue the music (we know the player is upstairs) and make it down to the dining room so quickly, injured leg and all? Libations: Steed: scotch and a coffee; Emma: red wine and a brandy; they both have a glass of bubbly at the end. One of the best of the series—the full five-glass salute! Image Transfer Review: This disc is another fine presentation from A&E. The colors, especially in the interior scenes, are brilliant and well-balanced, with natural fleshtones. No shimmering or edge enhancements noticed. There is occasional dirt and flecking, but rare. This is by far the best of the color discs thus far in the later series. The hues and contrast are specifically superb in The Joker—vibrant reds and deep wood-tones that hold their place. Also in this 2nd episode, there are brutal close-ups of the villain's face that show every line and imperfect pore in all-too-vivid detail. Good clean work. Audio Transfer Review: For a 33-year-old television show, this really is better than you might expect. The audio for the most part is balanced and clear; the score stays neatly behind the dialogue. There were even a few car chases that made me perk up, almost thinking there was activity from the surrounds. The score is a delight as always, thanks to the wonderful work of Laurie Johnson. Thanks again, old chap. Extras Review: It seems a huge shame that more extras are not included in this fine series of discs. Macnee and Rigg are very much alive, as are many of the production people and guest stars. A huge success in many languages on both sides of the Atlantic, the original program has a wide enough fan base to have warranted something more than stills. There are scores of websites devoted to the slightest bits of trivia—as much as I am thrilled to own this collection, I really think A&E dropped the ball in omitting anything substantial in the way of extras. 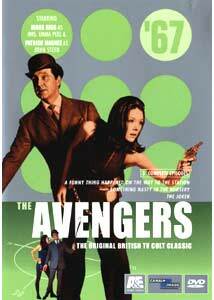 A decent range of plot, wit and diabolical masterminds in one stunning and two solid episodes make this disc a particularly good choice for even the casual Avengers fan.